Before we talk about flat screen vs curved screen TVs and monitors, let’s talk about the industry. Entertainment industries have reached a level in our lives from which it cannot be discarded. It is safe to say that it has become a basic need of life. For example, TV companies are always aiming to provide a more realistic and more thrilling TV experience to enhance our enjoyment. Between some, the most marvelous breakthroughs in TV set technologies is the famous and most recent “curved screen”. The attribute of a curved screen triumphs in technology, because within two years since its debut, it has become the next thing. The raging popularity of curved screens harbingers a future where curved screens will complete replace flats. Until that time, however, you should learn the differences between the two before you decide to replace your flat screen TV set. The most important advantage of curved TVs is the realistic experience that a curved TV provides. Is it true? Yes, through the last decade, a sleek aspect ratio (like 32:9 or 29:9) rose as one of the most preferred aspect ratios in movies and also even games. The flatness of a flat screen does not really go well by these aspect ratios. Distortion at the edges is observed, somehow disturbing the experience. Moreover, this aspect ratio is quite wide compared to its height. Flat screens have no option but to either zoom out the picture to fit the complete image, or stretch the image vertically which completely destroys the originality of content. 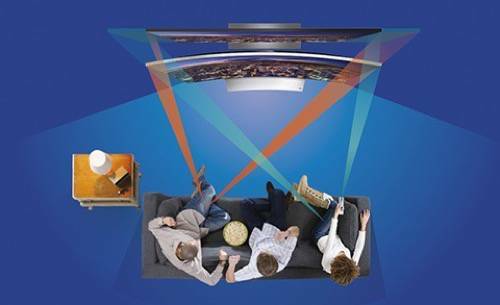 Curved Screens TVs are built specifically to fit the wideness of the picture without distorting the image in any way. Ultimately, this results in an original and realistic experience. Another debated characteristic of the curved screen is their immersive-ness. As in the screens are more perceptible and the viewing angle becomes wider for more people to fit in. As good as it may seem, this is only somewhat true. This argument by TV enthusiasts is not necessarily true. Yes, curved screens are slightly wider than flat screens but the difference may not be more than a single inch. The difference is quite insignificant. The very latest UHD 4K curved screens may be able to provide you with some immersive-ness, but definitely not to the extent you might be expecting. This one is an oversell. In comparing flat screen vs curved screen, which reflects more? In brightly lit spaces, both type of TV sets would reflect as if the screens are glossy. If the screens are made much of matte material, they would reflect less. In other words, the severity of TV’s reflection does not depend on the curvature of the screens. Thus, if the display brightness of the TV set is worked upon properly, it would not cause any disturbance in the contrast and color quality of the screen.